St. Martin's Griffin, 9780312595517, 272pp. One of the greatest spiritual teachers of the twentieth century will show you how to develop your sense of being in the now—and avoid the distractions of both your busy environment and your wandering mind. When the mind disappears and thoughts disappear, you become mindful. What is mindfulness? It is awareness. It is perfect awareness. 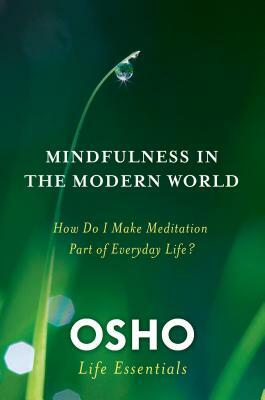 In Mindfulness in the Modern World: How Do I Make Meditation Part of Everyday Life?, Osho helps us explore both the inner and the outer obstacles that prevent us from bringing more awareness to all our daily activities. He emphasizes that while techniques can be useful in pointing the way, in themselves they are not meditation. Rather, meditation—or mindfulness—is ultimately a state of being in which we are capable of both action and stillness, work and play, and able to be fully present to each moment of life as it comes. Osho’s insights into the nature of the modern mind, with its tendency to judge and compare, provides a helpful entry point for longtime meditators as well as beginners. Mindfulness in the Modern World covers a wide range of topics, including five experiential techniques that will help you bring awareness to your everyday life.